Fare from around the globe served up at Spice Market Buffet in Planet Hollywood means this is a must-stop on your visit to Vegas. 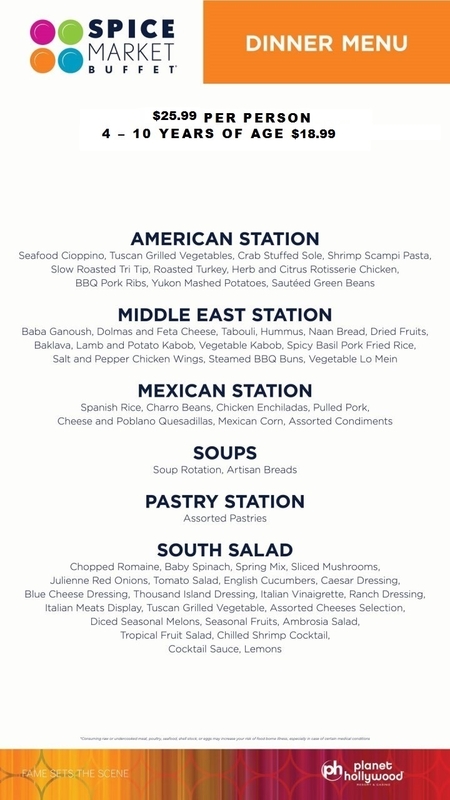 Dapple in dishes from Italy, Asia, Mexico and the Middle East presented in various stations throughout the restaurant. A fixed price which includes alcoholic beverages adds to the value of this extraordinary abundance of choices, sure to please the pickiest of eaters. 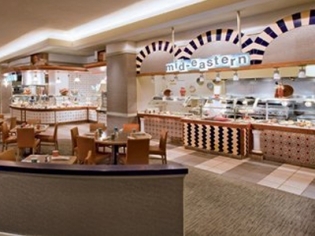 Enjoy a little bit of a lot at Spice Market Buffet. For Sunday brunch at Planet Hollywood’s buffet, you can even indulge with unlimited Champagne, mimosas and bloody Marys. The dessert buffet has custom crepes and the ever popular cotton candy. Had a Saturday lunch there, the food wasn’t bad, but I wouldn’t say it was excellent. I did find the layout to be acceptable and user friendly. It was horrible. The wait was long. Food was cold and tasteless. Service was poor. Complained to management and attitude seemed like who cares. This buffet has a pretty large selection, but I was a little disappointed with the quality. Except for the hostess seating us and taking our drink order which she didn’t even come close to getting right, all was good. This is usually one of my favorite buffets. Lots of options, but not great quality for the price. The desserts, however, might have made up for it– they were to die for! Fav Buffet on the strip. Been Vegas a few times and find the Spice Market to be my favourite for food, although when I was there last the waitress was quite miserable and not as attentive as they usually are. It was for my 50th birthday and we went for the champagne buffet. The food was, as usual pleantiful. This buffet has lots of choice and its like being a kid in a candy shop when it comes to dessert. They even have candy floss. Amazing!